I graduated with a master's degree in City and Regional Planning from College of Environmental Design, University of California, Berkeley in 1995. My specialization is application of information technology, especially geographic information systems (GIS) in planning and management. I hold a master's degree in physics also from University of California, Berkeley. Before coming to Berkeley for graduate school I attended undergraduate school in University of Illinois at Urbana-Champaign, studying physics, spending a brief period doing physics research at Beckman Institute under Professor Klaus Schulten. I am a faculty member at City College of San Francisco's Earth Sciences dept. and Engineering & Technology dept. Since 1998 I have taught beginner, intermediate and advanced GIS classes, now part of the GIS Certificate Program. I have previously worked for Total Immersion Software, a start-up software company in Alameda, CA producing computer simulation games utilizing GIS data. I have also worked for Pacific Gas and Electric Co. (PG&E) as a GIS application engineer for 12 years. My focus has been on engineering custom GIS software applications: for example, automated map design tools, analytical tools, GIS-linked tabular reporting, multi-user editing, GIS client-server administration tools, enterprise GIS system integration, web GIS services, mobile GIS. Prior to working for PG&E, I worked in the Applied Environmental Geographic Information Systems Laboratory (AEGIS) at UC Berkeley as a research specialist, under Professor John Radke. My resume is in my Linkedin.com profile (updated March 2008). Earthquake Risk Evaluation for Gas Pipelines: leveraging GIS integration in the utility organization. Abstract of my presentation (last item on page 20) at 2007 CalGIS Conference sponsored by Bay Area Automated Mapping Association (BAAMA). Pipeline Risk Management using GIS: deriving High Consequence Areas (HCA) and Class Locations for PG&E's transmission pipelines. Abstract of my presentation at 2005 ESRI (Environmental Systems Reserach Institute) User Conference. Rocky Flats Project: measuring effects of environmental factors on real estate values. Abstract of my presentation at 1995 ESRI (Environmental Systems Reserach Institute) User Conference. East Bay Hills Fire Hazard Survey: finished report with lots of photos and graphics. Berkeley Bike Route Model: This project is published in Berkeley Planning Journal Volume 10. PDF link. GEODESY Project: developing educational software to teach geography in K-12 schools. Showcasing places I have been to in the world and photos I have taken, my world travel map web page is a work in progress. Detailed with placenames (845 K) notice the San Andreas Fault! 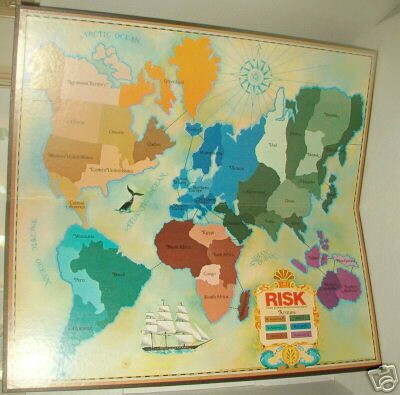 Revised Map for the Game "Risk"
The original map of world "countries" used for the war strategy game "Risk" was heavily biased toward creation of "countries" in the frigid Northern Arctic regions while omitting significant areas in the Tropics and Southern Hemisphere. 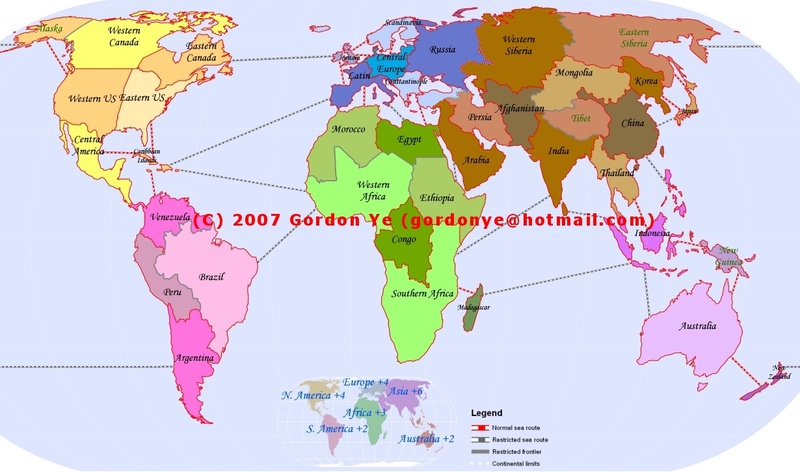 Additionally, the original map (based on Mercator projection) grossly enlarged the areas of Northern Arctic regions while shrinking the areas of Africa and Australia. In my version of "Risk" map, I use a more equitable map projection (Eckert IV) to portray the actual land area proportions of the world's regions. I reduced the number of countries in Europe/North America/Siberia while increased the number of countries in other continents, so that the capacity of a landmass to support population and provide defensible frontiers is considered when carving out countries. I also added attack routes across seas and oceans to correct the over-emphasis on land warfare in the original game.